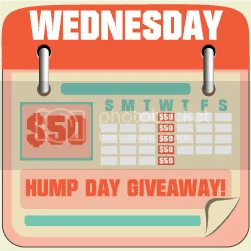 It’s time for Hump Day $50 Giveaway and today’s event is for Google+ Circles. Thanks to the 27 wonderful blogs listed below, we are giving away another $50 so please feel free to visit their blogs after joining. My Tots Exactly | Money Saving Mindy | Experience of a Super Mommy | I Heart Giveaways | Exotic Philippines | Beauty Queen Gene | WAHMaholic | Mirage | Coupon Queen of Texas | Our Food Trip | it’s not always about me | Pensive Thoughts | Happy Mothering | SWEXIE | Building Carpenters | Topics on Earth | Mom’s Ups and Downs| Frugal Experiments | Kenzie’s Kozies | Pinay Mama | Fabulicious Diva | It’s all about Me | My Tummy Calls | The Blogger Hub | Travel Unravels |NEW: After entering the mandatory entries, you will be taken to a separate page to add the 25 other sponsors’ page on to your Google+ Circles. Please completely ADD ALL 25 on the separate page to be eligible for the 25 points. All the sponsors will verify your entry and if you miss to follow one, your 25-point entry will be disqualified. After adding all 25 entries to your Google+ Circles, come back to the blog page you first entered on to complete the rest of the Rafflecopter tasks. For a short tutorial on how to Follow via GFC or to Add pages to your Google+ Circles, click here. On the first mandatory entry, please do not forget to write Pinay Mama referred you since it is a mandatory entry. You must complete the first 2 tasks before the others are enabled, and for all your other entries to count. Thank you very much and good luck. By joining this giveaway, you agree to the Terms and Conditions on the bottom of the form. Contest is open all-day Wednesday, from February 29th, 12:01am EST to February 29th,11:59pm EST (February 29th, 1:01pm Philippine time to March 1st, 12:59pm Philippine time). Thanks for the giveaway! God bless.